As usual Dave Chown and I arrived on the Friday afternoon. The temp was down but not too cold. Set up camp got the fire going and sat back with a coldie or 3. To all the first time entrants at Stanthorpe QEMSC and myself hope you all had a great weekend. Saturday morning arrived and the pit area was a hive of activity Gazebo's going up every where. Good to see these hearty souls rough it for the weekend and not be sooks and book into a pub or motel. Not every rider had a good weekend, Russell Bentley had a nip up on that beautiful looking Bultaco and damaged the paint work a little. Hope all is OK??. Bruce “Valentino” Russell has joined the Triumph R&D team in his quest to have a better handling Triumph?? Not sure if the front wheel being beside the engine is the right way to start Bruce? Walking around the pit area on the Saturday morning was a sight to be seen, The presentation of the old and not so old motorcycles has really improved over the years to the point where spectators actually stop and admire our race bikes. To all you solo racers, it appears that you all had a good time in Stanthorpe. 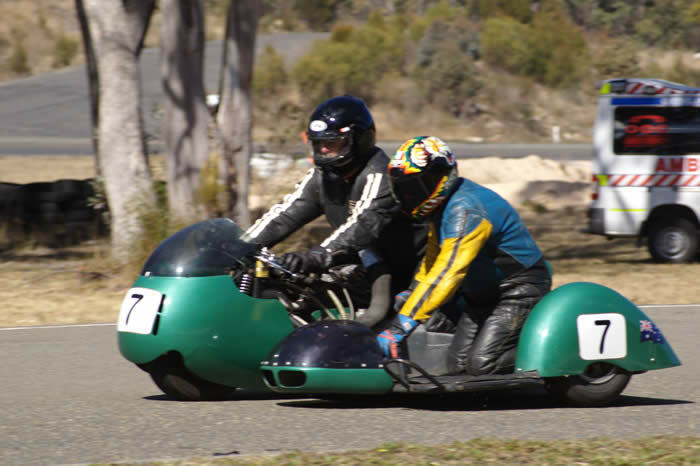 I know a number of the Stanthorpe entrants were doing some last minute mods for the Australian Historic Titles at Morgan Park in September. Now to the sidecars not all good news for us all. Tony Jacobs two Triumphs seemed to be all Ok. Milto's Triumph had some identity problems! Not sure if it wanted to be a single or a twin. Maybe you really did have the Manx magneto fitted Ian?? Gene and Vicky were having some fun on the Jacobs Triumph. A very special welcome Vicky, to the world of sidecar racing. Now to the 3 Post Classic sidecars that were entered. Rob Glock's Trident had an oil problem ( How unusual!!!!! Webaster Dave ). All is now fixed and ready for our big trip to Darwin. John Wormald's Honda seemed to be Ok for most of the weekend. Just have to get the starts right John? I will keep my mouth shut next time. After winding JW up about startline procedures, Glocky did not have it quite right when he let the clutch out at the drop of the flag to find he selected neutral. Last and not least was my own Post Classic Sidecar. With Glocky going south and me having nothing to do I spoke to old mate David the QEMSC webmaster to see if he fancied a bit on the side!!!!!. Of my sidecar that is. Fourth in our first race in nearly 2 years, a second in the next race. A broken gear change lever in the next race forced us out for the rest of Sunday. Then it was time to pack up and get on home after a great weekend at Stanthorpe. I am a bomb disposal expert. If you see me running try to keep up.